The wooden signs were fading. The painted signs had letters missing. There was masking tape over outdated information. A small painted rock sign had disappeared. What was left was a hodgepodge of deteriorating signs. The question was then whether to repair the existing signs or come up with a comprehensive plan, create a cohesive look and implement a long-term solution. The Board of Directors – with guidance from the Signage Committee and the Master Plan – chose to focus on a long-term solution. Stewardship of Meher Mount is a balance between minimizing the long-term impact of development and usage on the land and creating a maximum opportunity for visitors to enjoy nature and the special atmosphere that is Meher Mount. 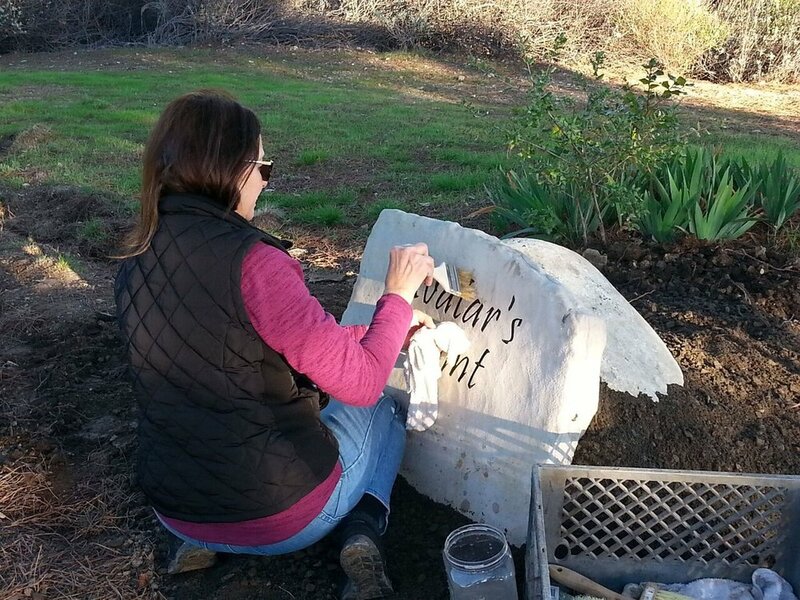 The Signage Committee was faced with that balancing act: signs to mark Meher Mount, identify key spots on the property and help direct visitors, while at the same time fit with the natural beauty of Meher Mount. Graphic designer Nancy Pinckert suggested using stone. The stone material was not only of the earth, but could also withstand weather, intense ultraviolet light, and time. She located Stonehenge Signs, Inc. of Quincy, CA. In discussions with then-owner Rob Conover, he suggested using Blond Quartzite Sandstone. It matched the local stone and soil in the Ojai area and was easy to work with. How much information on each sign? Which key spots and paths needed signs? What would the signs look like? All were questions that were answered. In developing the final signage plan, the committee walked the property more than once taking notes, measurements and evaluating options. In addition, there are: two directional signs to Reception; place signs for the Visitor Center and Topa Topa Patio; directional signs for Baba’s Tree and Baba’s Path; and place signs for Baba’s Tree and Avatar’s Point. The sizes of the stones varied and were chosen based on the ability to read them from a distance and to be clearly visible to all. The design was simple – a few words and the logo. The Pristina type font was used to be consistent with the Meher Mount logo. 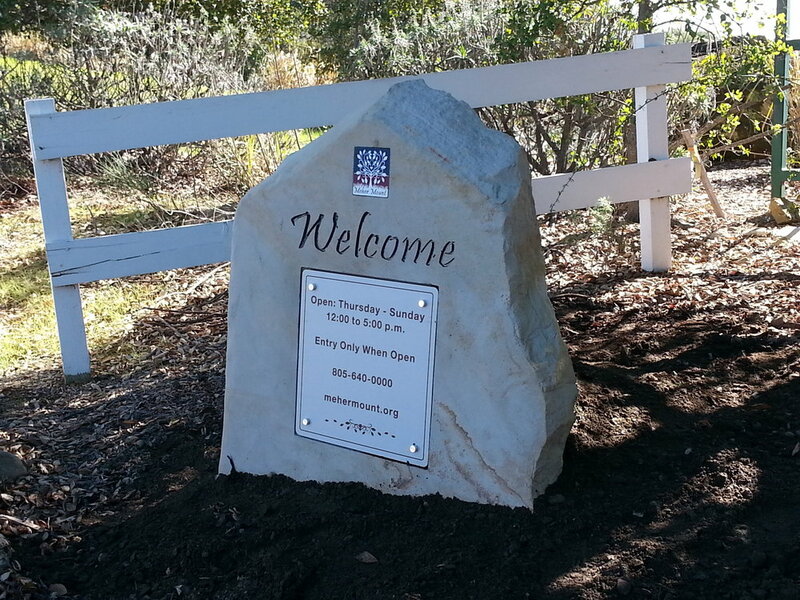 It was one of those glorious winter days in Southern California with clear skies and crisp weather when the group gathered at Meher Mount to install 14 new stone signs and markers. The Stone Sign & Marker project had been carefully planned. The signs were thoughtfully designed. The sizes of stones specifically chosen after several on-site visits. The final step was actually installing the signs in the ground. On January 12, 2017, Rob Conover and his wife Diane of Stonehenge Signs, Inc. arrived at Meher Mount from Quincy, CA – a distance of about 535 miles – with 14 signs on a flat-bed truck. Before the arrival of the stone signs, Manager/Caretakers Buzz & Ginger Glasky had carefully prepared each of the selected sites. Buzz and his grandson, Austin Bernard, dug 14 holes of sufficient size to hold the base of the signs. They spread a truckload of mixed gravel, sand, and rocks to act as a base. They had number of various-sized boulders delivered to help prop up and stabilize the signs. Finally, a crane and a crane operator were hired to join the group in the early hours to begin installation. The good news is that the winter rains had made the ground soft and easy for digging holes. The bad news is that the winter rains had made the ground soft and easy for digging holes causing the crane to get stuck in the soft dirt in the parking area. The driver – with some coaching from the group – spent two hours getting out of the mud. With that problem solved, installation continued culminating in the sign at the front gate. One of the reasons for choosing stone for the signs was because they could withstand the heat, UV light, winds and age. It was assumed they would require no maintenance. It turned out the some of the signs under trees were subject to bird droppings and dripping tree sap. A professional stone cleaner suggested regular washing. With the purchase of a power washer, those two or three signs under trees get a regular cleaning. The previous five-foot entryway sign was carved in cedar by Jim Auster in 2001. There is a beautiful spreading oak tree evoking Baba’s Tree and with the words “Meher Mount” engraved at the bottom. It was Jim's inspiration to write "Meher Mount" in letters that are a copy of Meher Baba's handwriting found in the book, In God's Hand. This sign has been relocated to the Topa Topa Patio and serves as a perfect backdrop for programs. Thank you to the Signage Committee: Margaret Magnus, communications director; Nancy Pinckert, designer and production manager; Marta Flores, sign advocate and frequent visitor; Ron Holsey, chair of the Landscaping Committee; Jim Whitson, board member; Buzz and Ginger Glasky, current manager/caretakers; and Ray Johnston, former manager/caretaker. They were aided by Byron Pinckert, consulting architect; Sam Ervin, board president; and Ken Pellman, supporter. Stonehenge Signs, Inc. produced all the signs and supervised on-site installation. Rob Conover’s advice, prodding and involvement helped shape and drive the project to completion. The removable information plaques embedded in two of the signs were produced by Machan Sign Company in Long Beach, CA. The Stone Sign & Marker Project supports the long-term legacy of Meher Mount. These markers create lasting reminders of Avatar Meher Baba’s presence at Meher Mount for the guidance of present and future generations of visitors.